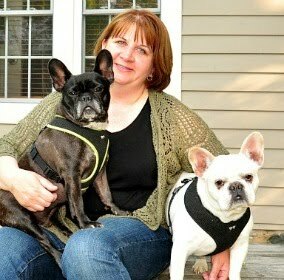 This is a re-post to bring it over from my cooking blog. It's one of our all-time favorites and a quick and easy meal. I just love one-pot meals so easy and less mess to clean up. This is a good, comfort food-style recipe and great when it's a busy evening. This recipe does include cilantro, which I know people either love or hate. We love it so we use it, but feel free to omit it. I've also successfully incorporated 1/2 cup of black beans and 1/4 cup of corn for a little variation. Heat oil in large skillet over medium-high. Season chicken with salt and pepper and brown in the hot pan, about 4-6 minutes. With tongs, transfer chicken to a plate. Add onion and bell pepper to skillet. Cook until the onion starts to become translucent. Add rice and a pinch of salt and pepper. Stir frequently to coat all grains in oil and cook until they start to toast. Stir in oregano, chili powder, and cayenne and cook about 15 more seconds. Stir in drained tomatoes and broth and bring to a boil, scraping up any browned bits. 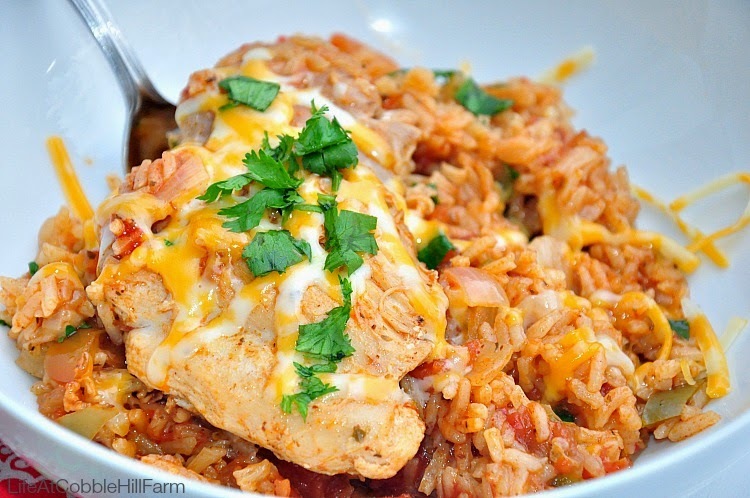 If using chicken breasts: Nestle chicken into rice, pouring any juice accumulated into pan, cover, reduce heat to low and cook about 10 minutes, until chicken is cooked through. Transfer chicken to plate and cover with foil. Stir rice, replace lid, and continue cooking until the liquid is absorbed, about 10 more minutes. 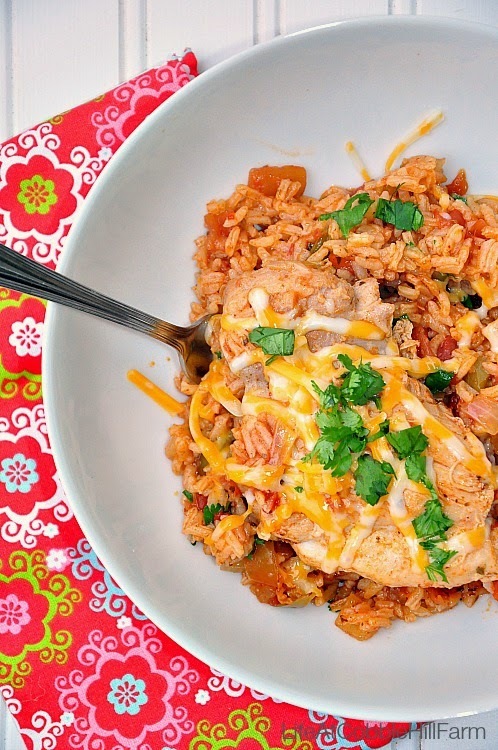 If using chicken thigh: Nestle chicken into rice, pouring any juice accumulated into pan, cover, reduce heat to low and cook 20 minutes, until chicken is cooked through and rice is fluffy. Stir cilantro in rice. 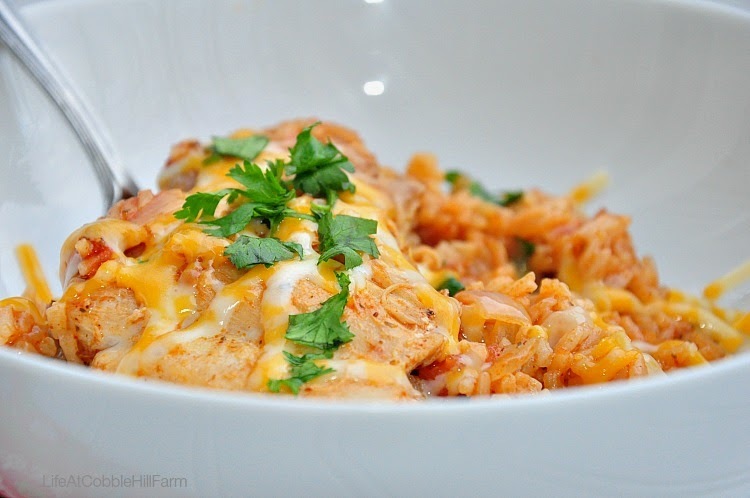 Serve rice with a chicken breast on top and shredded cheese over all. This looks and sounds wonderful, thanks! 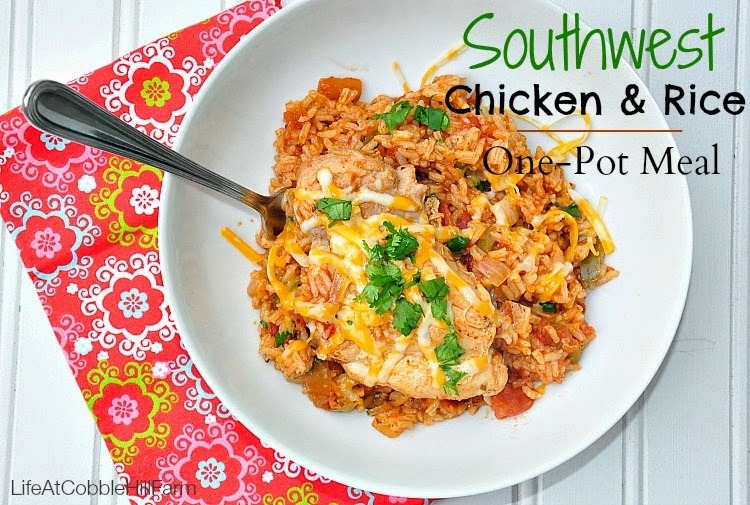 I'm a huge fan of one pot meals as well! Rachel - I'm with you. One pot meals are the best. Lisa - I'm so happy you tried it AND your family liked it. :) Thanks for stopping back and letting me know!! Love one pot wonders. This sounds so good, and I don't even eat chicken! I think I'd substitute black or red beans for the meat. Yummy!